SHAMROCK ROVERS bounced back from a miserable month to ease the pressure on manager Stephen Bradley with an emphatic success over Cork City. The Hoops were given a standing ovation by the Tallaght Stadium crowd after a well deserved success over the double winners. Bradley's side had not tasted victory since the visit of Sligo Rovers on March 30 and the young manager came under real scrutiny following back-to-back defeats to Bohemians and Bray and a late concession at home to Limerick. But there were signs of improvement in Friday's scoreless draw with Derry City at the Brandywell and they followed up on that here against a Cork side that lost the organisation which was a feature of their win over Dundalk. 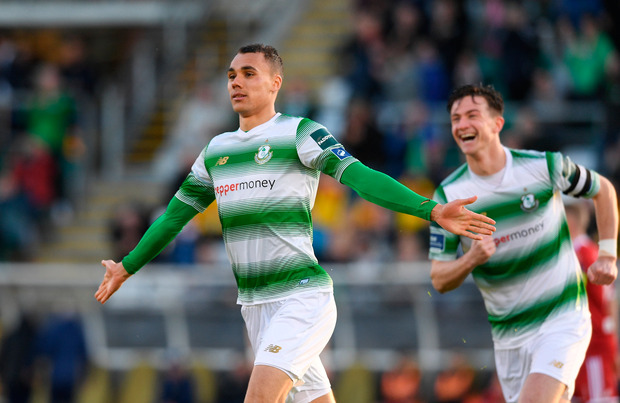 Indeed, John Caulfield's side came into this game off the back of four clean sheets, but they were two behind at the interval with a sensational third minute strike from Graham Burke sending the hosts on their way. Burke made space for himself 25 yards out before delivering a stunning right footer into the top corner which gave Mark McNulty absolutely no chance. Ireland manager Martin O'Neill had arrived just in time to catch that effort. Rovers built on that confidence boost and went on to extend their lead when a corner from Sean Kavanagh was turned in at the near post by Ethan Boyle. That was a fair reflection of the game to that point with Cork struggling to make an impression against a Rovers side that stuck with the three at the back formation that worked well in Derry, with former Ireland international Joey O'Brien on the right of that three. The experienced Greg Bolger and rookie Aaron Bolger functioned well together in midfield with Burke and Ronan Finn ahead of them. That said, Rovers did give up chances as the break approached with keeper Kevin Horgan coming to the fore after some tough experiences earlier this season. The Galwegian denied Garry Buckley from close range with a fingertip save before frustrating Graham Cummins and then Barry McNamee in another goalmouth scramble. Caulfield made two changes at the break with captain Conor McCormack and Danny Kane withdrawn to make way for Jimmy Keohane and Karl Sheppard and the latter was prevented from halving the deficit by a well-timed O'Brien tackle. Rovers had threatened from dead balls prior to that escape, and they trebled their advantage from that avenue with a Burke free eventually steered home by Roberto Lopes.